Work Weekend: Prenup Shoot at Las Casas Filipinas, Bataan! Spent my Sunday styling a beautiful prenuptial shoot at Las Casas Filipinas de Azucar in Bataan. Had fever, joint pains and chronic cough the night before but I decided to push through. Prayed a lot and drowned myself in different meds. Hihi. I was really looking forward to this shoot (out of town shoots are always fun!) and it proved to be worth it! :) Great team, lovely couple and Mich was there to help me. Couldn't ask for more. :) Photos below, but first what I wore! I have stopped searching for the perfect striped top! This piece from Basic House does it for me. It's knit yet lightweight, perfect for a whole day of styling under the sun. It also has 2 front pockets, very functional! Plus, the length is just perfect. I could easily wear it tucked in or out. Mich loves it and calls it my lakas makayaman casual top. Haha. Of course I had to partner my top with an equally cozy pair of jeans. I have shared with you how critical and particular I am with jeans or pants. I have no hips and I have skinny legs, so it's always a daunting task finding one that fits me like a glove. I gotta say, this pair from Wrangler is ideal! I love the snug fit, the fabric and construction quality, plus the fact that it's been around (tried & tested) for 70 years! Yuuup, it's definitely a legend in the jeans world. What I love most about this pants? The color/wash, the distressed style and that I can take it off easily without my feet getting caught in the foot hole! Hehe. Winner. Also brought my new yet preloved Zara trench coat (which I bought from Ebay) to save me from chills coz of my fever. Got lucky with this one! My quest for the perfect trench also ended when I found this. the groom and the photographers! Mr. Wrinkles the pug in his temporary home! random building in Bataan, beautiful. Snapped some photos of our surrounding before the shoot! Love the place! Reminds me so much of Vigan! Or Calle Crisologo to be exact. Turns out, the owner built this place by buying old houses or infrastructures in Ilocos (I knew it!) and other places, then brought and restored each one of them here (yes he transported the whole house) piece by piece, brick by brick. WOOOOW. hello Byron, Steph and Mr. Wrinkles! The couple had no concept when they came to me. I had them send me photos of clothes they want to use (mostly bursting with colors! ), their interests, hobbies and stories, just enough to start my concept research. Byron wanted to use props, so I also made these props my outfit inspirations. It was also my first time to actually create props! In fairness kaya naman pala! It helped that I have a secret artsy hipster partner (oo Mich ikaw yun) who mostly did all the work. Heee. I'm so proud of Mich! She also helped me shop for Byron and Steph. Naks. parang may sariling buhay yung balloons! kaya ayan cinorner nalang namin sila. so lucky to be always working with gorgeous couples! time to include Wrinkles in the frame! their love story started in Coffeebean, so it was only fitting to do a coffee date set:) Awww. all photos taken using our Olympus PL-1 camera! Had to babysit Wrinkles for 30 minutes coz he can't walk anymore. So sinakay na sha sa bike. Hihi. resting kuno haha. binibida ko lng the bouquet! P.S. Follow Wrangler and Basic House! Great photos and nice set up Paxie! Two thumbs up! i love your pants Ms.Aisa! the fit is obviously good and the wash is amazing! 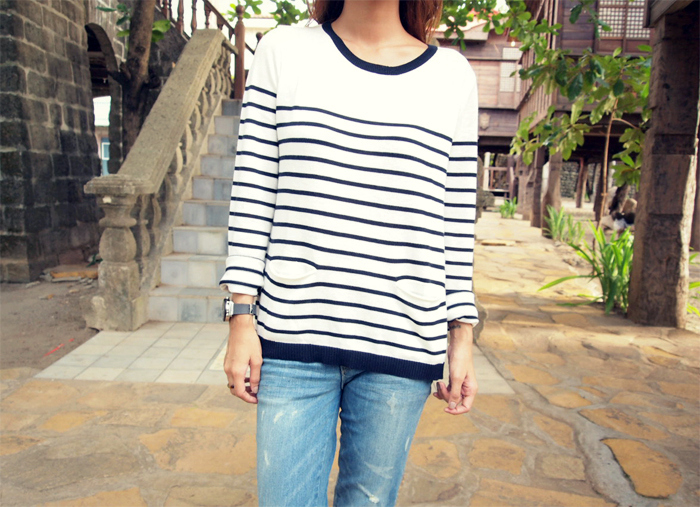 it's great with your striped top!! LOVE this look! the location of the shoot is so beautiful! 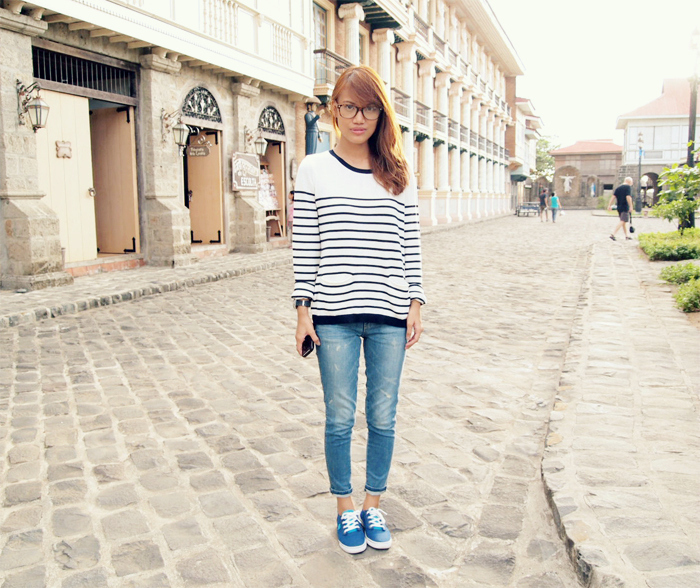 i didn't know there exist a place like that in Bataan :) the photos are nice! hi!paano magpareserve magpictorial sa las casas?kelangan po ba mmg permit?thank you!more power. Hi Aisa.Paxie! Thank you! :) already reserved the place. Btw, malapit lang ba iyong Max Restaurant sa Las Casas? Sorry po, medyo kinakabahan ako sa presyo ng food sa Las Casas. Too expensive. :( And if may idea kayo kung may iba pang fast food place near Max? Salamat po, sobra.